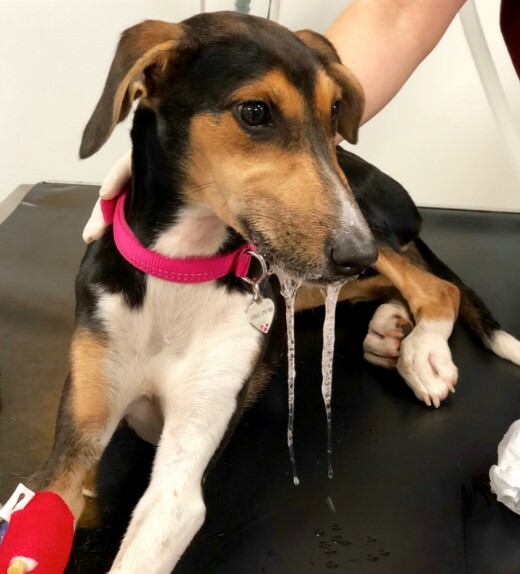 Heidi is a four month old female entire Lurcher, who presented after absconding from her owners for 20 minutes during a walk, following which time she was found in a patch of stinging nettles, distressed and vocalising. She was immediately presented to our first opinion team, at which time she was vocalising, salivating, rubbing her face, experiencing muscle tremors and had bilateral miosis. The hairs on stinging nettles are fine and hollow, causing them to break easily on contact with the skin and thus release secretions from the hairs into the skin. The hairs contain histamine and can therefore cause localised reactions. However, they also contain acetylcholine and so stinging nettle exposure can cause symptoms of excess acetylcholine. Excessive acetylcholine can result in three classes of clinical signs; muscarinic, nicotinic and central nervous system signs, but not all patients exhibit all classes of clinical signs. The muscarinic signs include diarrhoea, urination, miosis, bradycardia, bronchospasm, emesis, lacrimation and salivation (DUMBBELS). The nicotinic signs include muscle twitching and tremors, progressing to weakness and paralysis. CNS signs can include seizures and altered mentation, from obtundation to coma. Heidi was given chlorpheniramine intravenously and her mouth and muzzle were bathed with saline. She was treated supportively with buprenorphine analgesia and intravenous fluids. She was keen to eat, which appeared to temporarily distract her from the discomfort of her stings. Atropine is the mainstay of management of acetylcholine toxicity, but was not considered necessary in Heidi’s case, as she was not bradycardic, or having other significant muscarinic signs, such as dyspnoea. Her muscle tremors did not progress and it was not considered necessary to administer any anticonvulsant medications. The clinical signs will resolve within 12-hours for majority of stinging nettle intoxications and, by the following morning, Heidi had fully recovered and was able to be discharged. We hope she has learnt to avoid stinging nettles in the future!